After Black Friday and Cyber Monday comes Giving Tuesday, a worldwide day of philanthropy during the season of gratitude. Grace Cottage Hospital asks its friends and neighbors to participate in its Giving Tuesday campaign on November 27th and help fund a new cardiac monitoring system for its hospital patients. The price of the desired multi-unit system is $76,000. Thanks to eleven jump-starting contributions totaling $51,500, the Giving Tuesday campaign goal is set at $24,500. Such significant strides in telemetry technology have been made in recent years that the need for updating the hospital’s current system is evident. The new system under consideration offers a number of improvements including greater accuracy, reliability and alarm management, automated data transfer to patients’ electronic medical records so that all members of the care team have real-time access to vital information, and portability for seamless transition between care areas. “Living in a rural area should not limit a person’s access to the highest quality technology in critical care. 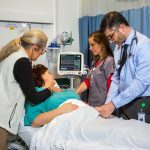 With this new cardiac monitoring system, our highly trained nurses can provide the best quality care regardless of our physical location,” offered Nurse Manager Rebecca Lapointe, RN/EMT. Last year on Giving Tuesday, generous donors allowed for the purchase of a non-invasive ventilator. This has proven to be invaluable time and again. It allows providers to deliver oxygen in an emergency situation safely and efficiently through a face mask, forestalling or altogether avoiding a more risky and invasive intubation procedure. This year, the hospital hopes to raise the funds necessary for the new cardiac monitoring system in order to deliver the best possible emergency and inpatient care to its community. On or before midnight, November 27, to make a donation by credit card, go to www.gracecottage.org or call (802) 365-9109 between 8 a.m. and 5 p.m. Checks may be made out to Grace Cottage with ‘Giving Tuesday’ on the memo line, and sent to PO Box 1, Townshend, VT 05353. Any money raised beyond the campaign goal will be applied to the Grace Cottage Patient Care Fund.